The First Part Last by Angela Johnson was not on my radar of books that I want to read. I am sure I would have never read this if it wasn’t assigned for the class that I am taking. And honestly, I read this because it was shorter than my other option. At less than 135 pages, I figured I could suffer through it. The First Part Last about a teenage boy named Bobby who gets a girl named Nia pregnant. He struggles between giving his baby up for adoption or keeping it. No vampires or witches here. I thought I would hate this book because I wouldn’t get invested in Bobby or the baby. Who cares about a teenage father, right? Wrong. Johnson beautifully constructs a story where every word is relevant. What Johnson accomplishes in less than 135 words is breathtaking paramount. I did not think I would relate to or care about Bobby. I mean it is so short, how can an author build that connection? Well, somehow Johnson does. I am so blown away by how powerful this book was. 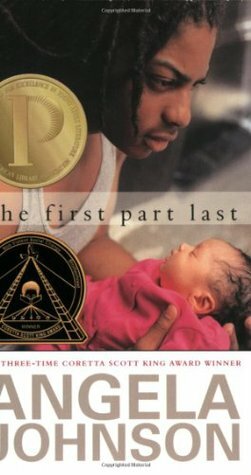 Even if you don’t want to read about an urban teen that is a father, read this. You will be glad you did. This entry was posted in Adult Fiction, Young Adult and tagged Angela Johnson, Read this book, The First Part Last. Bookmark the permalink.